Paintball is a sport that allows teams of players to compete in an exciting simulation of urban and natural combat. Speedball, Capture the Flag, Team Elimination, and several other game types have helped make paintball one of the fastest growing sports in the world. Anyone who is going to participate in paintball is going to first need a marker. Marker is the term often used to describe the paintball gun. There are over a dozen different paintball marker manufacturers, and they have become more high-tech in recent years. Where once they only included the actual marker, propellant and paintball hopper (container), today's markers include LCD screens, motorized paintball feeding, and more. Safety equipment is just as important as the marker. The paintball mask is one of the requirements for participating. Optional equipment includes pads for joints and extremities, gloves, and even chest and groin armor. Would you rather own a Bob Long Intimidator or a DM5? Which hopper works best for the marker you choose? Are the paintballs you want the right diameter? These are just a few of the questions that will arise while shopping for the right paintball equipment. Features custom built closed bolt paint guns, markers, air system supply regulators and accessories for paintball players. 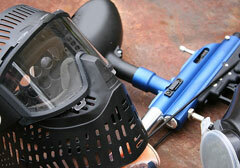 Offers a great selection of paintball gear and accessories for paintball players and the paintball industry. This New Jersey-based firm offers a wide range of goggle systems and protective gear for the sport of paintball, as well as paintball markers, competition gear, casual wear and accessories.